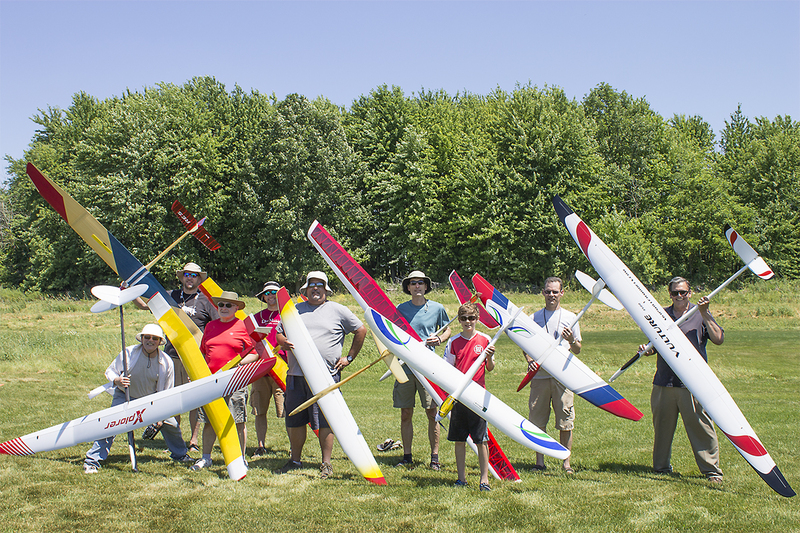 The West Michigan Soaring Society is a low key group of RC pilots with a passion for all forms of RC soaring. Whether your interests lie in winch, high start or electric launch, hand launch or aerotow, have never flown, or are an experienced contest flyer, WMSS has a spot for you. Our members come from all walks of life, from young to old, and we all enjoy the challenge of finding lift and soaring. Come join us to fly, learn, or just watch. We are open to anyone with an interest in soaring, and even if you’ve never flown anything before, we can let you safely try your hand at flying. If you find yourself daydreaming in the clouds and marvel at hawks and eagles mastering the rising air currents, come join us at WMSS. Spread your wings and soar!!! Our August contest has been moved from the 19th to the 26th in order to avoid a conflict with the Traverse City soaring club (LIFT) contest. Our calendar page has been updated. The 2017 version of our West Michigan Soaring Society Woody Contest was a success for sure, albeit a very windy one. Morning broke with several campers having overnighted at the field and the wind building. The sun shone upon us as 17 contestants turned out on Saturday for the contest. “Downwind” was once again our CD for this AMA Sanctioned event which was held at Walter RC Park in Saranac, MI. This is a dedicated RC park operated by Dave Walter and should be the envy of everyone in any aspect of the hobby. The pilots meeting began at 9:30 am with many pilots eager to get their planes up as soon as possible as the winds were in the teens already and promising to build under a beautiful, cloud dotted sky. Launching was fast and furious with a lot of folks lining up for the high start given the conditions, although the club winch and a OneWinch were also in use. With the “Ladder” starting at three minutes, given the wind no one was guaranteed making times. Throughout the day as the winds continued to build no one was able to get more than their 9 minute task although there were a few close to the 12 and the longest flight of the day being a little over 11 minutes. Dave Walter fired up his grill and prepared some burgers and dogs along with all the trimmings, sides and beverages for lunch. After the impromptu lunch people continued to launch with the wind building and gusting into the low 20’s. Around 3:00 we shut down for the day and awarded trophies (pretty cool if I do say so myself, with thanks to Randy Johnson for his help in providing them) for the day with winners in both Open and Senior classes as well as longest flight. At that point lies were exchanged and planes were packed for the day. Sunday morning dawned and was particularly cool for the end of June, definitely cooler than the day before and the wind was building over what we had on Saturday. The turnout was smaller but we had enough brave souls to continue with day two of the event. The “Ladder” started and as the day progressed so did the wind. I don’t believe anyone was able to get beyond their 3 minute task and due to the ever increasing wind, the contest ended around lunchtime and again trophies awarded. Overall we had a great turnout, a lot of fun, and a lot of flights. The carnage was kept to a minimum despite the wind. This style of event is proving to be popular and we were able to draw in pilots from the surrounding area, next year should certainly improve upon an already awesome event. Thanks to everyone who participated whether it was flying or shagging and retrieving chutes, and to those who traveled to be with us. SEE YOU NEXT YEAR!!! This past Saturday we held our first sanctioned contest since we lost our Sparta, Mi field about 4 years ago. John Winstanley is our CD. He contributed most of the effort making awards, scoreboards and the lion’s share of work that goes into pulling off a sanctioned contest. Thanks for all the work John. You did a wonderful job preparing for this woody contest! The Clarksville area sod farm is an ideal location, far enough inland from Lake Michigan to develop very good thermal activity. This area is glider country. 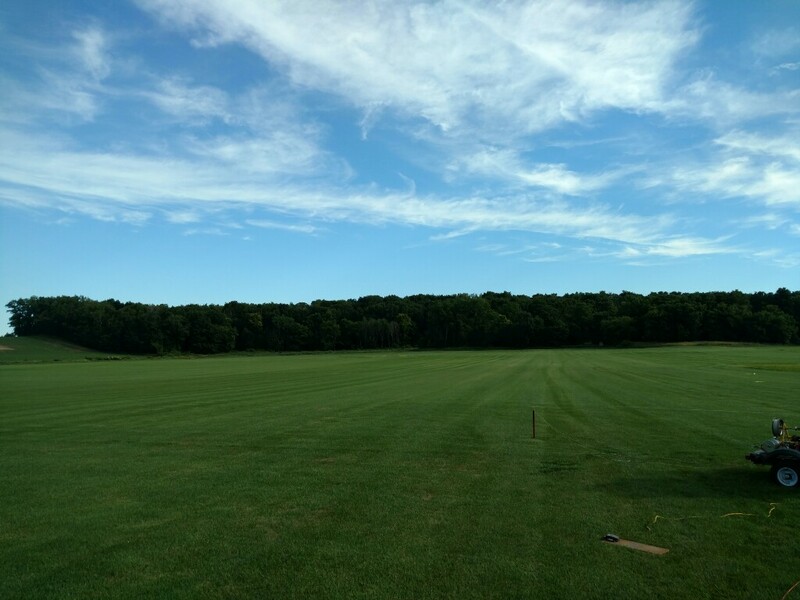 The setting is very rural, quiet, away from any traffic, homes, local/regional airports and most flight paths; it is an ideal place to fly RC gliders. On this day the winds were about 4-6 mph all day and the temperatures in the mid 70’s. Puffy cumulus clouds drifted over head throughout the day. My first flight was about 10:15 a.m. and lasted 19:37 seconds flying an Oly II wonderfully built by Ed Whyte. Larry Storie drove down with his wife from Traverse City pulling his winch built on a trailer. Larry flew a stretch wing Sagitta winning first place in the ladder competition. John Winstanley took second place flying his beautiful Windrifter built by Cal Posthuma years ago. Cal is pictured holding his glider on the Skybench Aerotech website. Click on the Windrifter under the Nostalgia Contest kits. I came in 3rd flying the Whyte built Oly II. I also captured the longest flight of the day with it toward the end of the competition, 35:48 seconds, if memory serves. We started off with 8 contestants. One dropped out early on with glider problems. We had two winches available with retrievers, a third winch without retriever and a powerful bungee cord. For some reason the bungee cord was very popular Saturday. I would say most flights were flown off bungee. Wide open space in quiet rural area. 3 fields generally available. Check our “Glider Flying Fields” page. Check out that sky. This was the perfect contest weather. At the end of the day everyone is still smiling and the gliders still intact. Click to enlarge. The winds Saturday were 5-15 out of the South with cycles of good lift, temperature near 90 degrees when we broke up about 3 p.m. 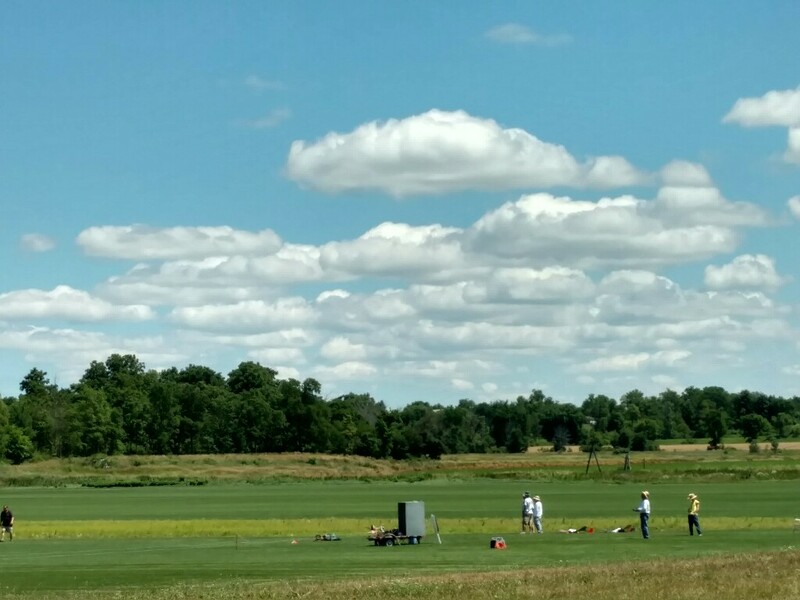 Weather was clear and the sod farm in beautiful condition. Eight contestants competed with power and winch launch. This was the first time several members competed. John Winstanley is the contest director for WMSS. John made the rules lenient for us less experienced. Three flights were flown with a 6 minute duration. Landing with in the radius of the 25′ landing tape was considered in bounds worth 25 points. Landing on the mark of 6 minutes worth another 25 points. The total minutes of all 3 flights are converted to seconds with each second counting as 1 point. Any additonal points for landing are added to the total and the pilot’s ranking is in order of points. It was fun. Everybody seem to survive with the gliders they brought with them. Our next contest, which is a “woodie” is AMA sanctioned and open to pilots from anywhere. That will be held at the sod farm in Clarksville too, scheduled for July 16 -17* (*will be an alternate if bad weather on Saturday). Francois introducing us to Kite Chairing. This is why he is our leader. Click to enlarge. Here are pictures of John’s Explorer. That’s a lot of sailplane. Flies wonderfully. Launch picture captured a “lucky break” just ahead of the chute before tension got too high. I went out with my DLG for a while. Hey WMSS, I really enjoyed today, great fun. Today’s contest task was 3 rounds of 5 minutes with a 25 point in-or-out 25 foot landing. The winners are Francois 4th (449 points), Jim McConnell 3rd (515 points, although his last flight was 10 minutes long. Still a max in my book. Jim Martin 2nd (552 points), and Tim 1st with an 805. I’ll take last place for never finding my own lift and just piggy backing off of everyone else, ha! Most glider pilots would agree that in this part of the World at least the winds have been far higher than many of us care to fly. 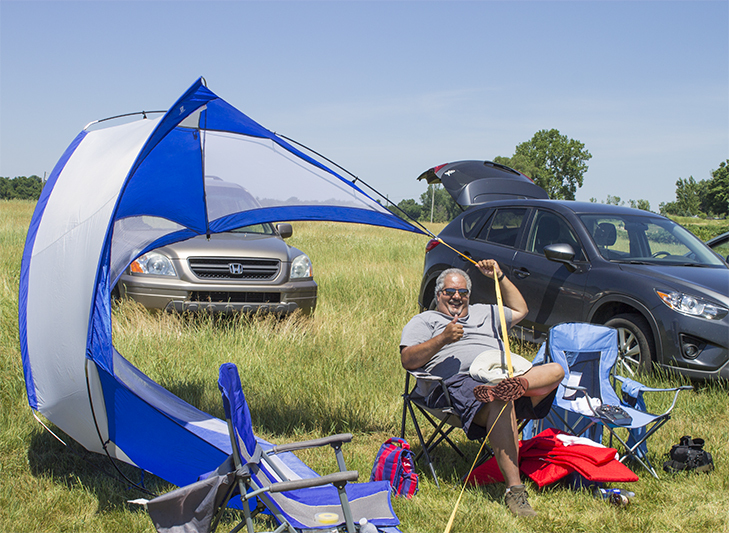 Not Sunday August 13th though…probably the best glider day this year at our Hudsonville sod farm. We all had all the lift we could handle. John Winstanley winch launched twice. The first with his lightweight Supra for an hour long flight. His second launch was a Windrifter (without spoilers), which ended with a 1 hour 6 minute flight. Two hour plus flights for John, back to back. A joy to watch John! DATES: Saturday, August 26 with weather day falling on Sunday the 27th. One Day Fun Contest: Rules to be announced soon. LOCATION: AAA Turf, Hudsonville, MI see map under “Glider Flying Fields” tab. AIRCRAFT: Any glider type you care to fly. Keep your eyes here for more formal flying information.